Hey everyone! Looks like the search is over. The rumors. The facts. The guesses. The ideas. She’s here, and there is no changing her. So why don’t you all give a big handclap to the newest American Girl, Miss Lanie Holland!!! So Lanie, why don’t you tell us about yourself? That’s cool! Sadly, both Chrissa and her friends and all her accessories are officially retired. Like the title says, Out with the Old, In with the New! Also, Kirsten is also officially retired and now only available through Ebay or Craigslist or other websites like that. It is a rumor that a new doll will be coming out this year to replace Kirsten as Rebecca did to Samantha. This will be exciting! Well, I hope you all have a great day! 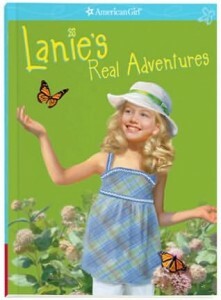 A few days ago, girls everywhere received an online invitation to Lanie Holland, our brand-new 2010 GOTY. According to this perticular picture, Lanie’s polo shirt seems to be a polo DRESS, a nice, knee-length one. Lanie is also accompanied by a small golden bunny with a leash. Her pet, maybe? It is official that Lanie is a “nature girl” by her invitation. Looking for a place to go the weekend of January 1? Why don’t you head over to any American Girl Store across the country? But get their FAST…the first 100 girls each will get their own Lanie-inspired goody bag and a chance to win Lanie’s collection. I wonder if they will have any kind of contest like they did with the previous dolls? For Nicki and Mia, they challenged girls to share their story to see if they were worthy to be “The Real Girl of The Year” and for Chrissa, girls entered a contest of making their own poster to help stop bullying, the guide line of Chrissa’s story. I was thinking, if they go along with Chrissa, that maybe Lanie’s poster idea will be about caring for the earth, and possibly ‘Going Green’.We’ll have to wait and see for the new fun and surprises Lanie will bring us! 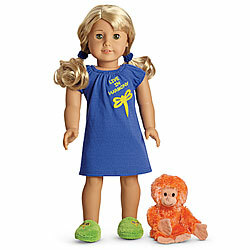 It’ll be fun to once again welcome a brand-new character to the world of AG, and American Girl Doll Central at that! OK, so we’ve got some MAJOR, GIANT, BIGGEST, NEWS EVER SO FAR FOR THE GIRL OF THE YEAR 2010 LANIE. Let’s review some “rumors” that have been spread. OK, so we’ve already heard some rumors about the Girl of the Year 2010. But now, we have FACTS!!! And GOOD ones, tooo0o! 4. Based on some research, she might very be an adventurous girl who loves nature, possibly. Well, those are your promises and promises and facts and facts. I can’t wait to meet Lanie! How about you? That’s all right now, I will get you new scoop later! Thank you, Doll Diaries!!! Lena pointed out that many times AG has tricked us with GOTY dolls, so we can’t be so sure. What is your idea of the GOTY? UPDATED: I NOW understand that Lanie is NOT African American. I have made newer posts about that. Some smarty people keep telling me that she is not, MONTHS after I told everyone that she wasn’t and even showed her picture here. 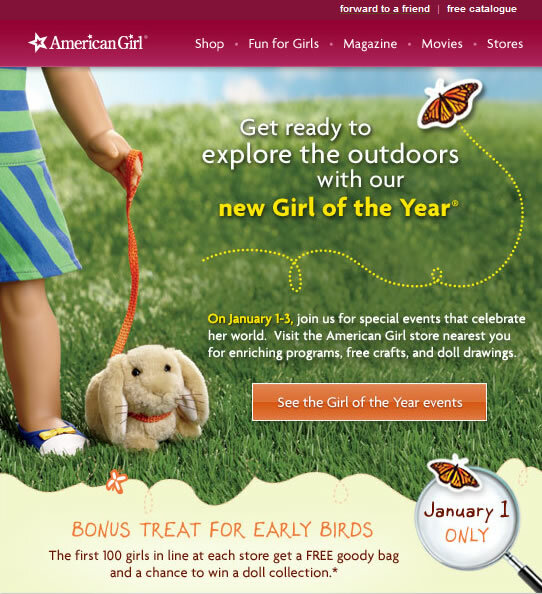 I keep this website updated with everything new about American Girl. If you look through old “new information” make sure you check newer information so that you know. 🙂 OH AND BTW, I never said she WAS African American, I simply said (about a year ago) that she COULD be.